Great product...I would recommend to a friend. Relax in ultimate comfort under this 100-percent brushed microfiber duvet cover. Featuring an elegant yet versatile Regal embroidery, it is suitable for a king or queen. Dimensions 12 in. x 4 in. x 10 in. Great Buy for my King size comforter. This duvet is worth much more than what I paid for it. It does have ties in each of the four corners, which makes it much easier top insert the comforterer. The fabris is very soft, and not real thin like others I have ordered. The embroidery on the pillow coveres is very pretty, and makes it look much more expensive. I would order a second one, if there was another color that would go in my bedroom. I highly recommend this duvet set. I ordered several of these in different colors. The fabric is okay. It doesn't wrinkle, but similar to the review I provided on the synthetic sheets..the duvet cover just doesn't feel as good as a duvet cover made of cotton, linen or some other breathable organic product. However, if you are wanting to save money, you can go with a high-quality sheet set that breathes, put the top sheet next to your body and then the duvet on top. It will look nice and you won't have to sleep next to it. The color is really pretty and the duvet cover is soft. I'd give it 6 stars if I could! 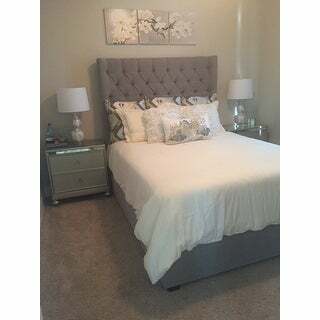 Moved and redecorated the master bedroom - I already have lots of grey furniture and other muted, neutral colors. Never been one to overly girly duvets, but this one, in Lilac is really beautiful. The color is stunning and the quality is great. Washed it immediately and now I'm thinking maybe more in other colors when this one needs to be laundered. Highly recommend. This is my favorite color so I really happy, it is so soft. I did iron it but didn’t really need to. It fit the comforter I bought from you perfectly. Love the embroidery around the pillowcases. I would buy this again & I recommend it Highly. The thing I dislike the most & that’s really my fault I would have bought the king size instead of the queen. The comforter is a queen. Really like these duvet covers. Great price. I would buy again. The fabric has a satin feel and looks and feels amazing. The comforter stays within the duvet really nice and doesn't bunch up... I have bought a few different duvets from other stores and this one is by far the best! The duvet is wonderful however I got black and it attracts all the dust bunnies and dog hair in my house. Other than that it’s a great duvet. My son loves it. Purchased this item on sale for my guest bedroom! Great product for the price! Looks beautiful! "Does this duvet have ties in the inside corners of this???" No. It has buttons to secure the opening but that is all. I have had no problems with the two I bought and am satisfied. No shifting inside. "Does the duvet cover have ties inside (in the corners) to keep the duvet in place? Also, can bleach be used on the white one?" Hello mabeline01, this duvet features button closer to keep the comforter in place. Yes, bleach can be used on the item, however, we recommend following the care label to help keep the product in the best condition. Thank you for shopping with us! Wrinkle resistant and easy to keep clean, already have the queen size cover set and look it, just too small.